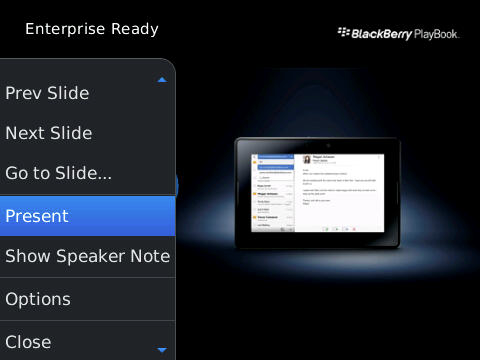 The BlackBerry Presenter is all you need to present PPT or PDF files from your BlackBerry. Powered by the standard BackBerry charger (with MicroUSB plug) it connects to a beamer or TV screen via VGA or S-Video. 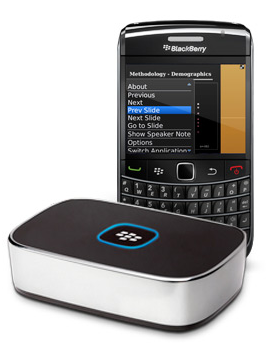 You pair it with your BlackBerry over Bluetooth, load the Presenter software and you are good to go. Once you are in presentation mode, you can jump around your slides, look at presentation notes etc. On the Torch I can advance slides by swiping the screen, but it also uses the same shortcuts you know from the mail app, like n for next and p for previous. 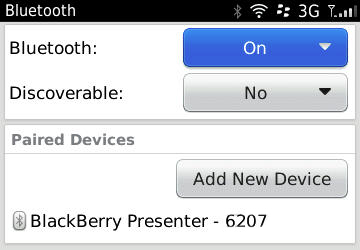 Setup with Bluetooth was easy and you get to select from known devices right from the Presenter software. The hardware supports Version 2.0 + EDR, Class 1.5, so you can roam around the stage while presenting. It won't be able to do all transitions in your PPT file, so test before you present. But this is by far the most portable presentation solution I have seen so far. And also the quickest. If you need an updated presentation, have somebody from your office send you the new file, download it to your BlackBerry and present on the big screen. The only thing I am missing is that you cannot mirror the device screen. This would be a neat toy to present BlackBerry applications. It's usually quite a hassle to present mobile apps, and this tool has everything you need to make this experience better. I recognized that you are using the leaked 6.0 FW for the Bold. Do you have any Problems with it? I installed it yesterday but I had no time so far for playing around, my Bold is not in daily use. I don't. I have a Torch which comes with BlackBerry 6.